What a glorius book! It has been sitting on my shelf for a while and for some reason I have not given it the time it deserves. Now, when thinking about what apple trees to buy it comes into its own. Written by an author based about ten miles from me and himself deeply involved in ‘old apple orchards and trees’, with their individual survival as well as identification. 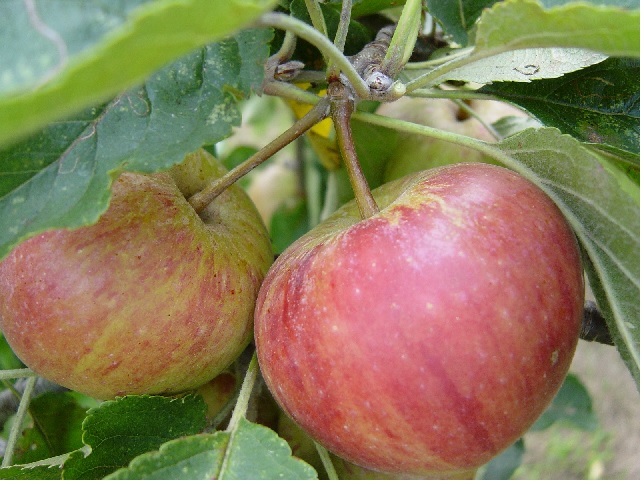 In the blurb the author successfully tracked down a ‘true’ Hitchin Pippin to be saved for cultivation at an old orchard in Tewin, now part of the Hertfordshire and Middlesex Wildlife Trust nature reserve. A book for anyone interested in the huge number of varieties in apples. Following this you get splendid photographs of apples on the bough. Something like 130 of the most popular types covering the broad spectrum found in Britain. You get a checklist of ‘apples of a County’ so you can select a particular, local apple. Concise chapters on choosing, planting, propogation, pests and diseases. Also a straight list of thousands of apple names (sorry, didnt actually count them) and a section on the research itself. The author gives special mention to his researches at Brogdale Horticultural Trust in Faversham, where they have some 2000 different apples in the collection. I have briefly visited the retail centre but when I go back it will have to be on Apple Day. I was an enthusiastic apple-eater from a young child (goodness knows why, must be the taste and texture), I would eat apples from our trees as early as possible, often too soon! I have done the scrumping bit and wandered round open-markets and supermarkets as I travelled over the southern parts of England during the last fifty plus years and bought any local, different sorts to taste. I have to admit I have been an apple-eater rather than a preserver….. Sadly I dont eat many varieties these days which is why this book is timely for my garden and my nostalgia. Nostalgia crossed with curiosity, as each page is a photo and description of the type in clear and enthusiastic style. The brief histories often surprised. How old they were and how travelled, or just local when first grown. From what seed or cross they sprang, appearance, growing conditions and eatability. Flowering, pollination group, harvesting and storage. All neatly included. It was interesting to see that some had travelled here from overseas, often having originated here but resettling in the likes of New Zealand before returning ‘regenerated’ into a new variety to settle and grow here again. Apples, a field guide is not a huge tome, really can be used in the orchards, but covers a lot of ground or rather types of the most common apples you would come across. If you meet someone who owns an old orchard then talk to them and taste the apples…… ideally when ripe. This book showed me my favourites and the few lesser known ones my father would sometimes bring home. Not forgetting the ones I have never seen and some never heard of. One surprise was the old Cox’s Orange Pippin in the garden of my childhood. A tree that was almost as old as the house, built in the 1880s, originated from Slough. It was brought to gardeners/ growers by Thomas Rivers of Sawbridgeworth (another place I spookily lived near) in 1862. It won an RHS medal in 1883 ( maybe that was when it was planted in our old house in Slough?) and in 1962 it won its First Class certificate. The author does not say if this was a simple Centennial award but I suspect not because today, another fifty years on, the Cox’s Orange Pippin is still a standard that has to be reckoned with. Last year I read an account of a writer spending a few weeks with a tinker on his travels in North Wales. It must have been in the 1930s. The point that comes to mind is that the gypsies were supposed to ‘plant’ apple pips on their routes, at or near their regular stopping places so that with the passing of time the trees that grew would produce fruit ‘from the hedgerows’ for themselves and generations to follow. Sounds romantic but pretty true so I will stick with it and add it to the norms of birds and assorted rodents or casually tossed cores. So now, as I drive through small connecting ‘B’ roads in mid-winter and see the old, tree’d hedgerows with the occasional trees bowing with apples I can imagine I am on an old gypsy route. Or just as likely an old herder’s route who arranged for potential free meals between farm and market place. Trends have moved on and the supermarkets have introduced new varieties and specifications over the years, sometimes detrimental to the eyes and tastes of apple-eaters and the apples themselves. I like to think that fruit selection has widened and improved recently, hopefully to benefit more local growers in supermarkets’ choices. Egged on by farmers-markets and such thinking as eco-damage and food-miles, also fruit quality and wastage. Not underestimating an increasing interest in quality and range from the public, the consumers. One supposes that more effective marketing for seasonal fruit and vegetables by independant producers and co-operatives as well as old folk like me wittering on, makes an impact additional to the supermarkets’ and governments’ enthusiasm for beating-on about the health and economic implications of eating well. I hope that the near future will see seasonal piles of more interesting apples wherever they might sell (Yes, I know it is getter better….) The establishing of successful cheese-shops selling well-produced, hand-crafted cheeses from around the country and continent has pushed supermarket chains to improve their deli-counters and cheese ranges. The chains still fall down on product knowledge at the counter but maybe I have seen the wrong person at the wrong time. Perhaps the cheese shops and stalls that know their product and market so well, that have added biscuits, wines and ports to their shelves to benefit the cheeses, could think about highlighting a local apple or two at the height of its flavour. A bit of local colour, you might say. Check out this book and see that you could have ripe apples from August to January, eating or cooking. But first you have to find the apples. Start searching with this book.